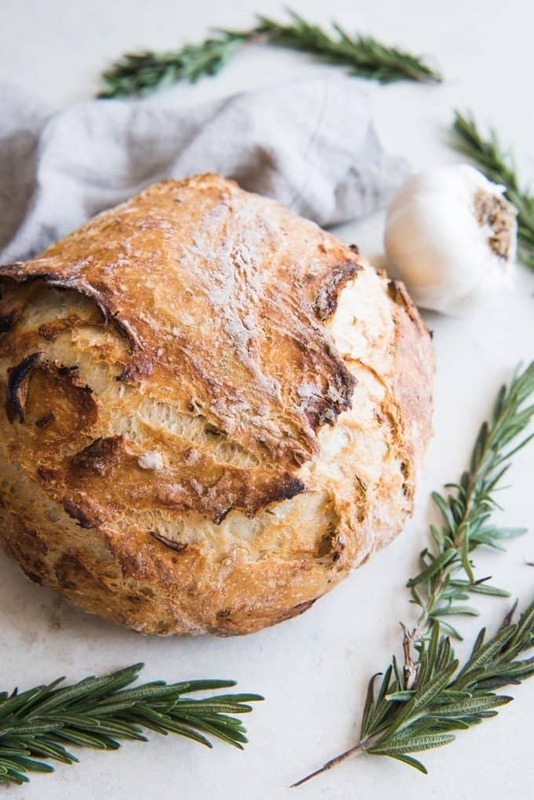 If you love crusty bread like I do, especial super flavorful breads that are great for dipping in balsamic vinegar, slathering with butter, or using to make elevated grilled cheese sandwiches, you are going to adore this easy Roasted Garlic & Rosemary No Knead Artisan Bread! For anyone intimidated by yeast breads, this is the bread recipe for you. There is no proofing yeast involved. There is no kneading required. It’s as simple as stirring everything together in one bowl and then leaving it alone. No need to assess the stickiness or smoothness or elasticity of the dough. And no need for fancy scoring on top of the loaf before it bakes, although you could dust the top of the loaf with flour and score a pattern or “X” shape in the top if you get really ambitious (which, as you can see from these photos, I did not). A thick slice of this crusty bread is amazing with a bowl of lasagna soup or zuppa toscana. 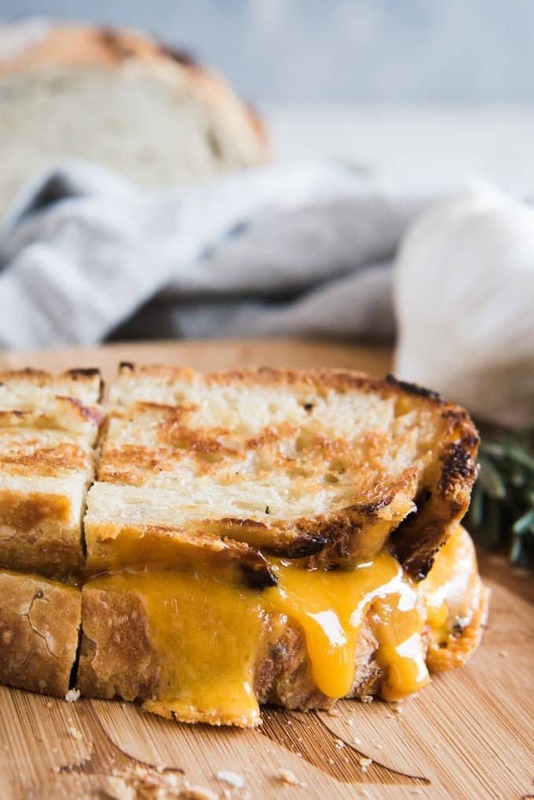 And it really does make my favorite grilled cheese sandwiches ever with some cheddar melted between two buttered slices of this bread and then toasting it all on the griddle. 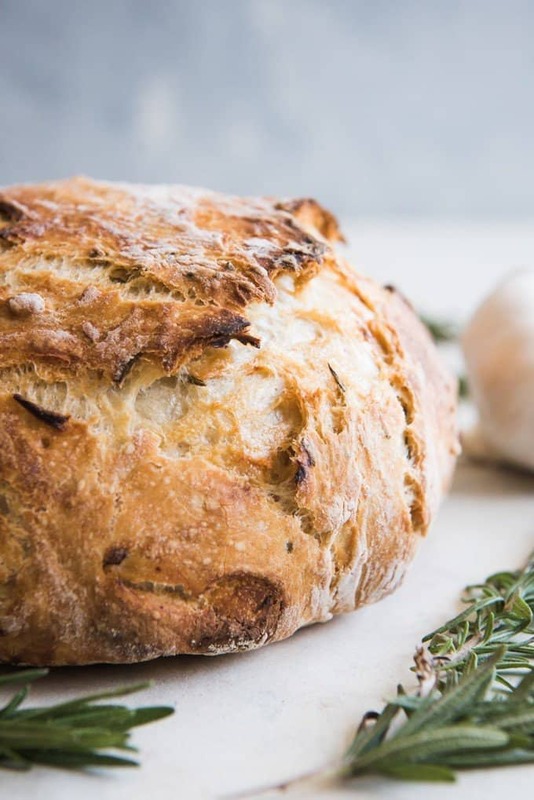 Try adding 1 to 1 1/2 cups of mix-ins in the following combinations in place of the roasted garlic & rosemary for a totally different and delicious bread! 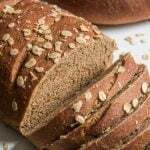 Or leave out any mix-ins for a perfectly wonderful plain loaf that will go with any soup, salad or dinner! 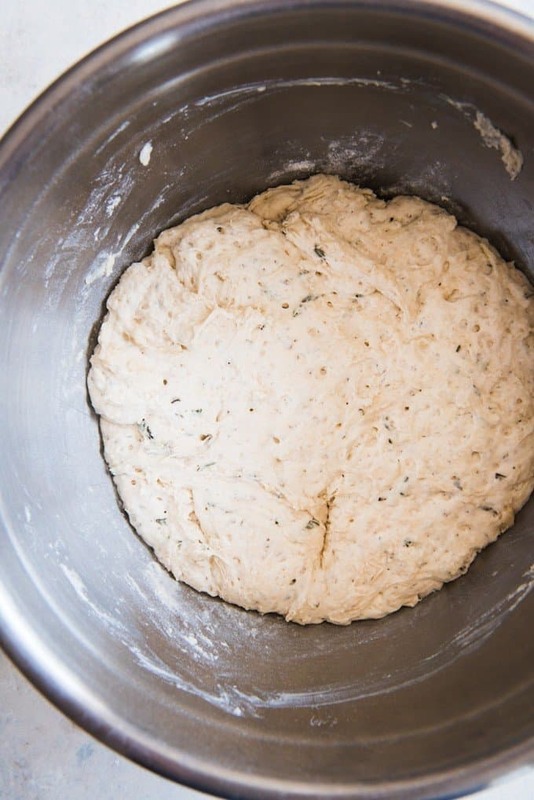 Mixing the dough together is pretty much as easy as it gets. 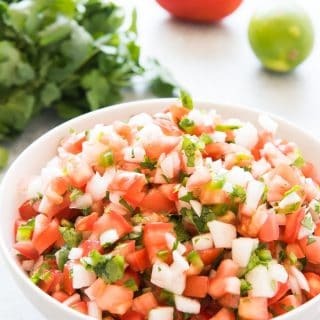 All of the ingredients (including mix-ins) gets dumped into a bowl, stirred up, and then left on the counter for 12-18 (or even up to 24 hours). “Shaping” the loaf consists of dumping the sticky dough onto a well-floured surface and forming it into a roughly ball-shaped lump. The bread rises slowly as the gluten and flavor develop over a long period of time. Then, when you are ready to bake, there are two approaches that I have used and both work well. METHOD 1: My preferred method is to use a 5.5 quart enameled cast iron Dutch Oven with a lid (I have this one but less expensive options work just fine!) but you could also use a baking dish covered with aluminum foil, your crockpot insert, stainless steel pot with a lid, a pizza stone with an oven-safe bowl big enough to cover the bread, and an old cast iron Dutch oven that you probably only pull out for camping trips. The lid (or aluminum foil) traps moisture in with the bread while it bakes for 30 minutes, then you uncover the loaf and bake for an additional 10-15 minutes at the end to let it get golden brown on top. 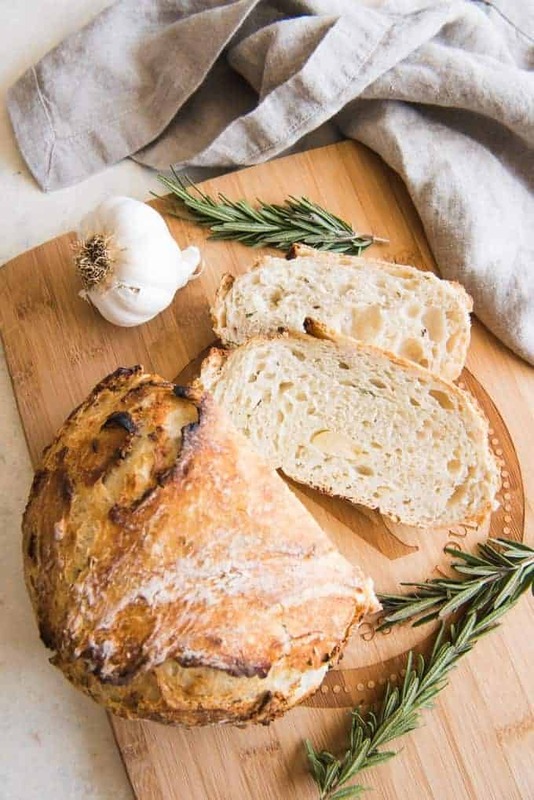 METHOD 2: Alternatively, you could bake this roasted garlic & rosemary no knead artisan bread on a baking sheet with no lid. But you will want to create steam in the oven by placing a cast iron or metal pan on the rack below the one where you plan to bake the bread while the oven preheats. 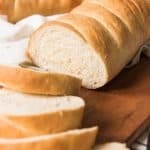 Then, when you are ready to bake the bread, place the loaf on a baking sheet inside the hot oven and pour 1 cup of water into the hot cast iron or metal pan on the rack below the bread and immediately close the oven door to trap the steam and bake for 25-35 minutes, until the crust is golden brown. I have even heard that instead of using a pan, you could just throw a handful of ice cubes in the bottom of the hot oven instead, but I haven’t tried that approach yet. 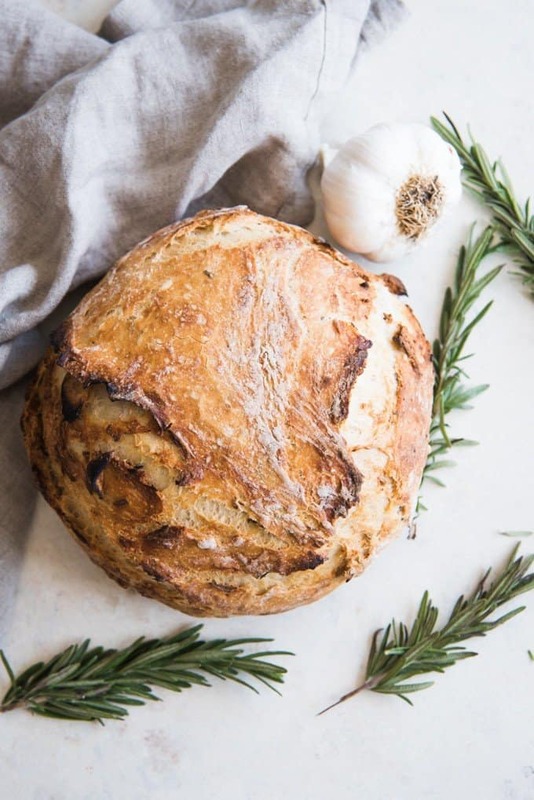 Once you have tried making this Roasted Garlic & Rosemary No Knead Artisan Bread, try something a little different where you can practice your kneading with these Cheesy Garlic Mozzarella Swirl Rolls! Or if you forget to prep this the night before, try my Easy Rosemary Focaccia Bread that is almost as easy and is ready in under an hour! 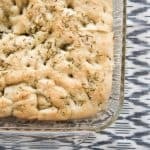 If you make this bread (or one of the flavor variations mentioned above), I would love to see your results! It makes me ridiculously happy when readers share what they make on Instagram and tag @houseofnasheats! I have switched it up and used bread flour in place of all-purpose flour with good results, or some combination of the two, if you prefer bread flour for making bread. 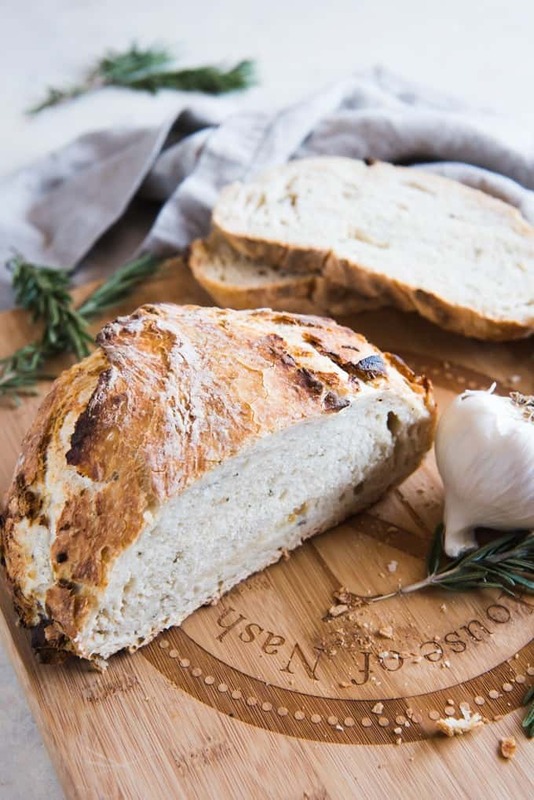 Adapted from The Comfort of Cooking via Simply So Good (and probably countless others - the basic recipe for this crusty bread has definitely made the rounds and is so simple that bread has likely been made this way for centuries before food bloggers came on the scene). I love making homemade bread. I just find it so satisfying…and the aroma is magical. I would have a hard time waiting for this to cool so I could devour it. I could eat no knead bread all of the time! I especially LOVED all of your suggestions for add-ins! Im definitely going to definitely try several of them. And ps…. the photos of that melted cheese…. OMG… Stunning! Love rosemary and garlic together and in bread it’s just sooo good. Texture of this loaf looks perfect, love that it’s no knead. I just made a similar bread recently! So good with a nice beef stew or other cozy soup! I’ll have to try this one with the roasted garlic. Yummmm! This looks so impressive and I can’t believe it’s no knead, would love to try this at the weekend! I love the crusty exterior. That grilled cheese sandwich looks delicious! I don’t make enough bread and this is something I need to try. Great photos! I kinda go crazy for roasted garlic and rosemary anyway…. but in an artisan bread? Give me the whole loaf! Made the bread with rosemary and parmesan cheese. It turned out delicious! I used a glass container with a lid and it worked perfectly, soft in the middle, crusty on the outside. Fantastic! I’m glad it turned out so well for you! I didn’t realize that baking bread could be so easy. This recipe has changed my life. The overnight wait is the only drawback but it’s still totally worth it. I’m so glad you tried this then! How can I cook this on a pizza slab? Just use Method 2 as mentioned in the post above and create some steam using a pan of water placed on the rack below your pizza slab. 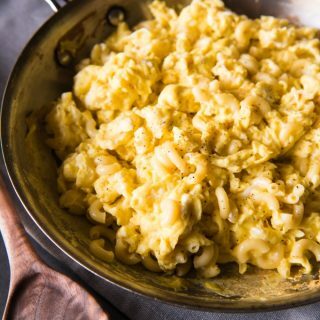 Quick question as i cannot wait to try this recipe, would an oval Dutch oven work okay as well or does it have to be round? Yes, an oval Dutch oven would work just fine! 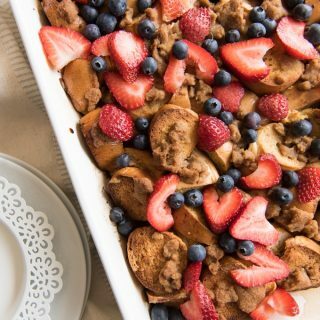 Thank you so much for sharing this recipe, I think it has become a favorite with with many home bakers. I also make a savory bread but it is a soft bread yet very delicious. I use celery and cheddar cheese, perhaps we can substitute this for another flavor it will be nice, about 2 or 3 celery sticks and a cup of grated cheddar cheese or a strong flavored cheese of your choice. Happy baking and good eating. Do we chop the garlic? No, just leave it whole! It sounds crazy, but really it’s so buttery and mild that it works. And when you slice the bread the garlic will inevitably be sliced a bit as well. what happens if you let it sit for 20-22 hrs? You can do that – the flavors just get stronger and stronger as the yeast ferments. Hi Amy! So glad I came across this recipe as it is my new favorite and I’ve made it twice in one week! One problem I’ve had is that it doesn’t rise in the oven. It leaves me with a skinnier bread which is fine for toast and side bread with dinner but not for sandwiches. I’ve tested my yeast and even bought new to be safe. Any pointers? I’m so glad you love this bread as much as we do! With this type of bread, the best way to get it to be higher is to use a small dutch oven pot, which sort of forces the bread to go up rather than out. I want to try this! 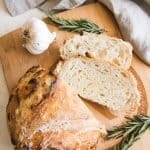 I’ve tried two Dutch oven breads and they have been great! But I use quick rise yeast and don’t let it rise for as long…as I’m not sure I should! Can I let it rise just as long as you say with the quick rise yeast? Thoughts? I don’t really know if using quick rise yeast would cause less time to be needed or not. Part of the thing is that the longer, slow rise time also helps develop a unique flavor in the bread so I wonder whether that would change. I might have to get some and experiment! Great recipe! Could you post the ratios for the other mix-ins? I will have to write them down as I make the different variations because I haven’t tried all of these – they just sound like good combinations to me or I have had similar versions at restaurants. But the idea is to not do more than 1 1/2 cups of mix-ins total. If its something like herbs, that will be a lot less because they impart a much bigger flavor with just a couple of tablespoons. I don’t have a 2 quart Dutch oven so I’m not sure how that would work. My guess is just fine – it would just make the bread taller, which isn’t really a terrible thing. Any size will work, really, as the bread is going to bake up just fine regardless. The only difference is going to be the final look of the bread. I’ve even done it on a baking sheet totally free form and the bread was still tasty even if it didn’t get very tall. Can the proofing be done in the refrigerator over night? No, I don’t think that would work as well actually because it would slow the process down so much and it’s already the long proofing time on the counter overnight that makes this no-knead bread really work. The flavor was really good. I didn’t have a whole garlic head so I chopped the one clove I had and also added about 1/2 tsp of powder. I doubled the recipe and I should have cooked it as 2 separate loaves. I dumped all the dough in one big cast iron. The bottom was overdone and the middle was gooey. I put it back in the oven at 350° for 15-20 min and got the middle cooked but it was spongey and very dense. 2nd try … getting better each try. This time I had a mostly full bulb of garlic that I roasted – yum! It really makes the bread next level. I again doubled it but this time I cooked 2 separate loaves. My mistake this time was putting wax paper in the bottom of pan. The bread didn’t stick to the pan but the wax paper stuck and practically became imbedded into the bottom and sides of bread. I was sad to cut off the yummy crusty exterior but bread was still fantastic. I’ll keep trying and hopefully eventually perfecting. Oh no! Yes, definitely use parchment paper instead of wax paper for baking. I loved this recipe! It was so easy to make and tastes amazing, just like from a bakery! I can’t wait to try different variations. I love this bread! So easy to make. I can’t wait to try with different variations.